With the launch of the new telehandlers KT407 and KT429, the company is offering a total of eleven models, between 6 m and 9 m stacking height, which are equipped with many innovative details for professional agricultural businesses. This in addition to the 13 wheel and telescopic wheel loaders. 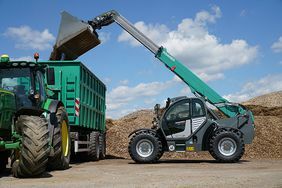 Since June 2018, Kramer has offered two new telehandler models of the 4 t class, the KT407 and the KT429. 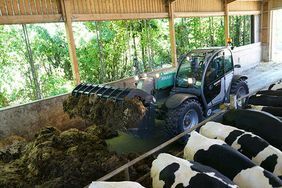 The Kramer telehandlers for applications in agriculture are characterised by their sturdiness, versatility and efficiency. The new telehandlers impress with their intuitive operating concept. Beside the implementation of the new normative regulations in the model year of 2018, a new operating concept enables intuitive operation of all functions thanks to the electronically controlled all-in-one joystick and the Jog Dial control panel. For example, the sensitivity of the joystick can be adjusted individually. All relevant vehicle data and settings are displayed on the new 7-inch display. As a special innovation, the KT507 (optional), KT557, KT429 and KT559 models use the new hydrostatic “ecospeedPRO” drive with 370cc displacement for increased tractive force and driving dynamics. There are numerous additional options for customers of telehandlers. This way, the machines can be precisely tuned to the individual needs of the customer– increasing versatility in all applications. Learn more about the telehandlers by Kramer.